WiiWareWave Turns 3 Today: Updates And Celebration Begins This Week! Time To Make A Splash And Party! 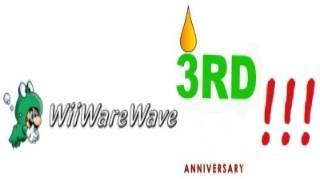 WiiWareWave was started on March 16th 2011 by myself and co-owner Sneaker and we've had our ups and downs, but today is a big milestone as our website has reached its 3RD anniversary! In celebration we'll be starting The WiiWareWave Show this week and will try to hold a new contest sometime this week! We'll also update our website with new features such as the one shown below! Our staff will be writing several History of WiiWareWave features this with their accounts of our website and the changes it's gone through since they joined! Anyways we couldn't have survived this long without fans like you so we would just like to say, thank you for supporting us for these three long years! We hope to hear your thoughts in our comments below! Re: WiiWareWave Turns 3 Today: Updates And Celebration Begins This Week! GamerZack7 wrote: Tanjoubi Omedetou, WiiWareWave! Wow! It's been three years already?! @NINTENBRO82 wrote: Wow! It's been three years already?! Congratulation with milestone happy anniversary!